1st edition, 1890, Routledge; reprint several times; 457 pages. THE MAGICIAN'S WAND, THE MAGICIAN'S TABLE, AND THE MAGICIAN'S DRESS. PRINCIPLES OF SLEIGHT OF HAND APPLICABLE TO CARD TRICKS. CARD TRICKS WITH ORDINARY CARDS AND NOT REQUIRING SLEIGHT OF HAND. TRICKS INVOLVING SLEIGHT OF HAND OR THE USE OF SPECIALLY PREPARED CARDS. THE "CHARLIER" SYSTEM OF CARD-MARKING, AND TRICKS PERFORMED BY ITS AID. CARD TRICKS REQUIRING SPECIAL APPARATUS. 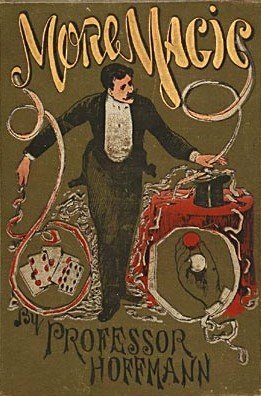 METHODS OF SLEIGHT OF HAND APPLICABLE TO COIN TRICKS. COIN TRICKS REQUIRING SPECIAL APPARATUS. TRICKS WITH WATCHES AND RINGS.